Perhaps, most people in Indonesia and overseas people only know Sumatera's "Tenun Songket" (Songket Fabric). But In fact, there was a very famous woven fabric called Buya Sabe or Sarung Donggala (Donggala woven fabric) in Donggala, Central Sulawesi. It's not only in the traditional process, but there is also a modern manufactured that was ordered specifically. Unfortunately, it's only can be ordered in java. Donggala woven fabric are not only known as a women's traditional handicraft in Donggala, but Donggala woven fabrics characterize Donggala that contains the value of art and culture. In Towale Village, Banawa District, Donggala, making Donggala fabric has become the mothers routine activities. This activity has become the main occupation for young women up to middle-aged mothers. Not surprisingly, every home has at least one traditional loom. Even, there is one house that has such equipment as much as three units. For Donggala woven fabric artisans in Towale, they claimed to adept to make woven from their parents for generations. Making Donggala woven fabric, nearly same with fabric making process in other areas. Both of the process of coloring yarn to weaving. Interestingly, in the Towale village, the Donggala fabric artisans, the number reached 300 people. 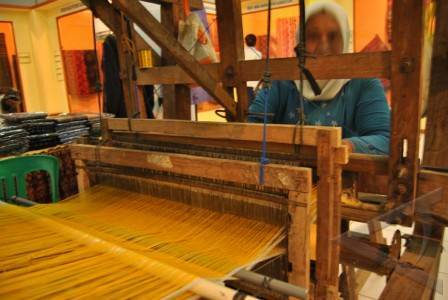 The making process of Donggala woven fabric is depending on the pattern of fabric. In Donggala, there are six types of making techniques and fabric pattern. There are Palekat Garusu fabric, Buya Bomba, Buya Sabe, a combination of Bomba, and Sube. Among these patterns, the most difficult to make is the Buya Bomba Pattern. the process takes one to two months, differ than the other patterns that only takes one to two weeks. "For the Buya Bomba, we do it carefully. Because we want to produce a lot of pattern. usually, it takes up to two weeks", Dayama said, one of fabric artisan. Donggala government, in preserving the Donggala fabric, they collecting all the traditional artisans in Donggala. Even, for manage and preserve the Donggala fabric, Donggala government issued local regulations about it. "that regulations issued for keeping Donggala woven fabric sustainabilty and it can not be duplicated by others. In the other word, it as a Donggala patent,'' Habir Ponulele, Regent of Donggala. In Donggala Regency, traditional artisans of Donggala woven fabric, located in three districts, Banawa District, District Tavaili and on the west coast. Last edited by pharaphoto; 28-05-2012 at 11:18.